And now for some exciting news, BONG!!!!! 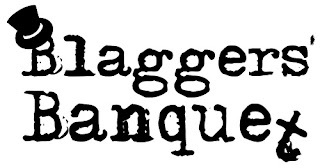 "On November 15th, Londons’ Food & Drink Bloggers will be taking over Hawksmoor, the revered steakhouse in Liverpool St, for the Blaggers’ Banquet. For any further information, please contact Niamh Shields (niamheen@gmail.com) or visit http://eatlikeagirl.com/blaggers-banquet/"
And I shall be one of the blaggers getting involved in this wonderful event. Having volunteered my services, I have been picked to work in the kitchen. Finally my skills as a potato peeler supreme have been recognised! The really funny thing is that no-one has considered my penchant for cooking wearing only skimpy undergarments, it does get hot you know. Boy, my follow blogging compardres are in for a shock next Sunday. I will of course be reporting back after the event but if you wish to be there on the night or would like to donate then please please do go in for the auction for tickets and for the auction in the coming weeks (I will be posting details when they come available). I've seen the blag list, there are a lot of fantastic goodies to be won. Sounds like it is going to be a brilliant 'one off' night, in aid of an exceptionally worthy cause. Best of, to you all!